I had many old ideas about Yoga. I thought it required more of me than I was capable of delivering – athleticism, flexibility, concentration skills, etc. I thought I would hurt myself if I contorted into those crazy poses. I thought Yoga was for young skinny people. On my own, I would not have enrolled in Yoga classes. So, when my dear friend JoAnn called me and said, “Hey, I’m gifting you three Yoga classes. Come to the beginner’s class with me. It’ll be fun!” I’m not certain why but I just said, “Yes”. Let me back up a bit… my husband Steve and I moved to Port Angeles in January of 2015. We were thrilled to be retired and able to move to this community. We were making friends and ready for our next adventures. We had a minor setback in that I needed to have my knee replaced in October of 2015. I recovered well and we were ready to really enjoy our retirement. We met so many lovely people and we felt at home here. We were thriving. However, in July of 2016 Steve was diagnosed with cancer and passed away the next November. I was in a state of shock and despair for which I doubted I could recover. Volunteer Hospice Grief Group helped tremendously and a community of angels in this community, including JoAnn, carried me through this difficult time. Still, I was in the throes of grief and I had not been taking very good care of myself. I had lost a great deal of flexibility in the knee that was replaced. I wasn’t doing very well. I felt like I couldn’t breathe. 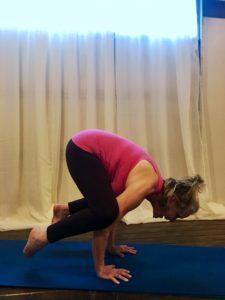 So, when JoAnn suggested I join her for Yoga – saying “yes” was a great beginning. It’s been several months now and I just love going to classes. I became a monthly member after those three introductory classes. I do my best to keep saying, “Yes” to the next class. Yoga practice is critical to my physical, emotional, spiritual and mental wellbeing. I attend Beginners Basics on Tues and Thurs, Slow Flow on Wednesdays and Restore on Saturdays. I don’t like to miss my Yoga! The quiet, joyful teaching style and community of Yogis (no matter what our level) sustains me. I feel lighter. I feel a part of. The despair and debilitating grief is gone. Yes, I have my tears. In fact, I cry all through the Restore class – but that’s good for me. I let the tears as well as the joy come up and out of me in class. I laugh out loud during Beginner’s class when Jenny asks, “Are you breathing?” I don’t have to pretend I’m some kind of blissed out guru or physical contortionist. (That was an old idea of mine too!) I get to breathe again.